How to find LCM using Prime-Factorization? What is HCF or GCD? LCM is important for time and speed, time and work problems. LCM is also important for circular racetracks, bells, blinking lights, etc. HCF is important for largest size of tiles, largest size of tape to measure a land etc. That means, 12 has many factors (1,2,3,4,6,12). Such number is called a composite number. On the other hand, consider this number: 29. You cannot find it in any table except 29 x 1 =29. Such number is called a prime number. Now hold this prime number thought in your mind for a while. First, let’s create multiplication tables of 4 and 6. Do you see any common numbers in the multiples of 4 and 6? Yes I see 12, 24 and 36 are common in both tables. Let’s isolate them. Ok so 12, 24 and 36 are common multiples of 4 and 6. But what is the smallest of these multiples? Ans 12 is smallest. Suppose there is a circular race track. Tarak Mehta takes 4 minutes to finish it and Jethalal takes 6 minutes to finish it. Now both of them start running from the same point at the same time in the same direction. They’ll continue running on this track forever. So after how many minutes will they meet for the first time on the starting point? Ans. LCM of time = LCM (4,6)=12 minutes. They’ll meet again on the starting point after 12 minutes. Two traffic lights blink at an interval of 40 and 60 seconds respectively. After how many minutes will they link together? Ans LCM (40,60). HCF is also important for remainder related questions. but I’ll cover that in a separate article. Suppose in the exam, we need to find LCM of 4 and 6. Now you need to find the prime factors of 4 and 6. Now make the third row called “LCM”. As you can see, maximum power of 2 was 22 (in 4’s row). That’s our answer. LCM (4,6)=12. Anyways, Let’s try a difficult one: 56 and 96. First recall, in which tables do they come? Well 56 comes in 8’s table and 96 comes in 12’s table. but we need factors in “prime number” format. 12 and 8 are not prime numbers. So let’s Simplify further. 96 = 12 x 8 = (4×3)x(4×2)=( 22x3) (23)=25x3 (please note you have to do this things in your head, if you start making every calculation on a piece of paper, you’ll run out of time in the exam). Now let’s make the LCM row. Write all prime numbers (2,3 and7) in ascending order. Now write maximum powers of each prime number. 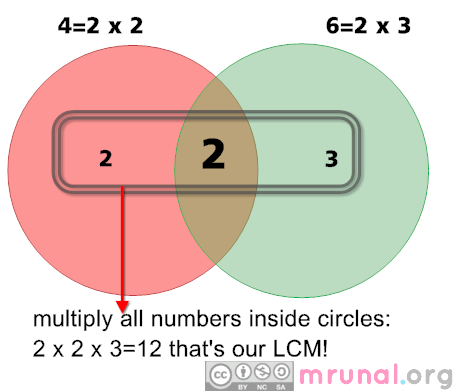 let’s try finding LCM of three numbers. Make a new row, write all prime factors in ascending order. In the last row, Write the maximum power of those prime numbers. 20 x 3 = 60. So 60 is the least common multiple. So 1001 is the answer. Co prime numbers are those numbers that donot have any common factors. For example, 14 and 15. Individually none of them is prime number because 14=2 x 7 and 15 = 3 x 5. But they (14 and 15) donot have any common factors. So they’re called co-prime numbers (when they’re given together). Any two consecutive numbers are co-prime numbers. (e.g. 11,12 or 1548,1549). Extremely fast when you’ve to find LCMs of two digit numbers for example 12,15,96. And usually in time speed work, pipe-cistern type questions have number in two digits (e.g. 12, 15, 96)…so it is very easy to recall in which multiplication tables do they come. Becomes tedious, as the number grows bigger, for example LCM (235, 512). There are other methods to solve those LCMs, but let’s not complicate this article any further. Let’s stick to this Prime-Factorization method for a while. Ok so far we know what is LCM and how to find HCF/GCD? GCD= Greatest common divisor. Names are different otherwise they’re one and same. Suppose you’ve to find the HCF of (4 and 6). Ok, in which number’s table (1, 2 or 3) do you see both 4 and 6 reappearing? There are two such tables 1’s table and 2’s table. 4 and 6 are common in 1’s table. 4 and 6 are common in 2’s table. 1 x 6=6 2 x 3=6. If I divide 4 by 1, I get zero remainder. Similarly if I divide 6 by 1, I get zero remainder. In other words, 1 is the factor of both 4 and 6. In other words, 4 and 6 come in the table of 1. Similarly, If I divide 4 by 2, I get zero remainder. Similarly if I divide 6 by 2, I get zero remainder. In other words, 2 is the factor of both 4 and 6. In other words, 4 and 6 come in the table of 2. Thus, 4 and 6 have two common factors (1 and 2) but highest of these common factors is 2. Therefore HCF of (4,6)=2. Two drums contain 400 and 600 liters of desi and foreign liquor respectively. What is the biggest measure (cup) that can measure both of them exactly? Ans. HCF (400, 600). A teacher has 40 pens and 60 pencils. Find maximum number of students among whom she can distribute these items evenly. In the exam, we can’t make multiplication tables of every number preceding the given numbers! So here is the shortcut technique. We’ll use the same approach we’ve used in LCM method: prime factorization. First make prime factors of given numbers. Now, make third row: HCF and write the prime numbers that are common in both numbers. But I want them in prime format. So I’ll further simplify. In the exam you’ve to do this in your ^head. Now make a new row, write the prime numbers that are common in all of above. The numbers highlighted in bold are common. 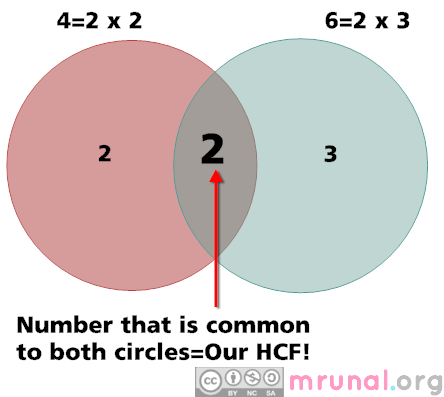 Therefore HCF = 22 x 3=12. Again same: 1, because co prime numbers donot have common factors. Similarly consecutive numbers (like 456,457) donot have common factors either. Therefore, in all such cases, HCF =1. HCF x LCM = a x b. But this relation only work for TWO numbers and not for more than two numbers. You know that LCM (4,6)=12 and HCF (4,6)=2. LCM X HCF = a x b. But this is not always true for three numbers. For example, Find LCM and HCF of 12,15,20. You’ll get HCF=1 and LCM=60. In this case, both sides donot match. 15,30 30. which is equal to the biggest number (30). 15,30 15. so it is equal to the smallest number 15. In all such books, the authors first give 5-6 illustration examples and then exercises. I suggest you solve the the illustration examples as well. After all aptitude is all about practice. Very nicely written!! Thank you for the knowledge shared. 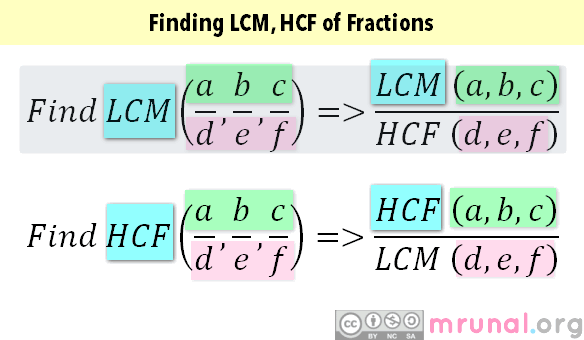 It is very helpful to clear the concept of LCM and HCF. Thank you!!!! Let the numbers be a and b. Then, a + b = 55 and ab = 5 x 120 = 600. The sum of two no is 100 theirs LCM IS 120 HCF? Your concept is very good.